CURRY: All right, Kelly O'Donnell , thank you so much . Well, Sharon Bialek is now with us, along with her attorney Gloria Allred . Good morning to both of you. Ms. GLORIA ALLRED: Good morning, Ann. CURRY: Lots to get to. First, let's address immediately this -- your response to the Cain campaign calling you, quote, "a woman with a long history of severe financial difficulties and personal bankruptcy." You have filed for bankruptcy twice. Is your coming forward a part of any kind of financial motivation? Ms. BIALEK: Absolutely not. And you know what, I had spoken to Gloria about this before. There's no -- there were no skeletons in my closet. I told her that this may come up and I expected this. This is -- this is what happens. It's not about me. I'm not the one running for president. Ms. ALLRED: But it's also important -- it's also important to know that she could have sold her story. She, like millions of Americans, has financial difficulty, she's up front about that. Ms. ALLRED: She didn't though, because she wants to just tell the truth. CURRY: But -- point taken. Did anyone with the other campaigns encourage you to speak out? Ms. BIALEK: No, absolutely not. I came of my own volition. CURRY: Then why after an event you say happened 14 years ago are you only coming forward now? Ms. BIALEK: ...so that -- for those reasons. CURRY: You're absolutely sure that he used the words "You want a job, right" those were his exact words? CURRY: Well, the Cain campaign, as you know, has since disputed this saying in a statement, quote, "All allegations of harassment against Mr. Cain are completely false. Mr. Cain has never harassed anyone." What is your reaction to that? Ms. BIALEK: I think maybe Mr. Cain 's definition of harassment might be different. Maybe he doesn't feel he harassed them. CURRY: Well, Gloria , does this actually technically qualify as harassment? You know, Sharon no longer worked for the National Restaurant Association ? Ms. ALLRED: Well, she may have had rights nonetheless because she was seeking his help in getting a job. But the real question, Ann , is, you know, should the public believe the word of four different women, two of whom filed claims of sexual harassment and received settlements for them or the word of one man who has a motive to deny. CURRY: Well, here's another question that's being raised by the right. The question as you just heard it reported in Kelly 's report that this is a part of partisan politics, that you, Gloria , just before the California election for governor, you held a news conference with Republican Meg Whitman 's fired housekeeper who was an illegal immigrant and she lost the election. I mean, and you've also contributed thousands of dollars to Barack Obama and also to Hillary Clinton . So is this a politically motivated effort on your behalf to represent Sharon ? Ms. ALLRED: Absolutely not because the last big news conference I did in New York was against Congressman -- Democratic Congressman Anthony Weiner . And my client said that he should resign, that he had sent her sexual messages and that was one of the reasons that she thought he should resign. I've also criticized President Clinton when he lied to the American public. So if a man commits an injustice against a woman, sexual harassment , which, by the way is no joke although apparently Herman Cain wants to make it a laughing matter, then I am going to speak out against them if they're Democrat, Republican, Libertarian or no party at all. CURRY: All right. Gloria Allred and Sharon Bialek , thank you so much . Ms. BIALEK: Thank you, Ann. CURRY: I know this is not the last we're going to hear about this, so we'll say how this proceeds. 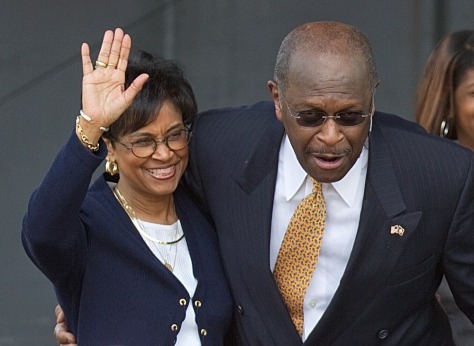 Gloria Cain, left, accompanies her husband Herman Cain as he announces his run as a Republican candidate for president in Atlanta on May 21, 2011.